How do you learn to appreciate the blessings of a roof over your head, getting plenty of exercise, and having plenty of food on the table when you’re hungry? One of the best ways is through responsibility for the care of another living being. So it is with our animal projects. By being responsible for the daily care of a calf, a pig, or a horse, our young men come to understand the commitment and discipline that it takes to care for another being. Youth at Westview are encouraged to participate in any of several animal programs. They can work with the horses on the south campus, the pig program on the west campus, and they can be a part of the calf show team on the north campus. 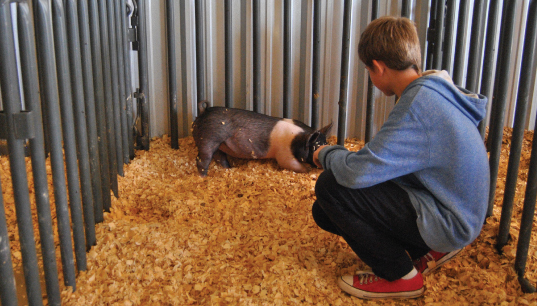 In the pig and calf programs, youth raise the animals to show in local, county and state shows and receive financial and trophy rewards as a consequence. The day of a young man with a calf is a long one. His morning begins at 5:00 a.m. with the morning feeding, and in the cold of winter, breaking the ice in the water trough. Before leaving for school a couple of hours later, they lead their calves into the cooling house where the animals spend their day. At noon, their caregivers bed the calves down for the afternoon. After school, the young men wash and brush their calves, taking care to blow the hair dry when done. Then it is time to clean the cooling house, feed, and check the water troughs. This is a lot of hard and routine work, but it develops discipline in our youth that leads to success. 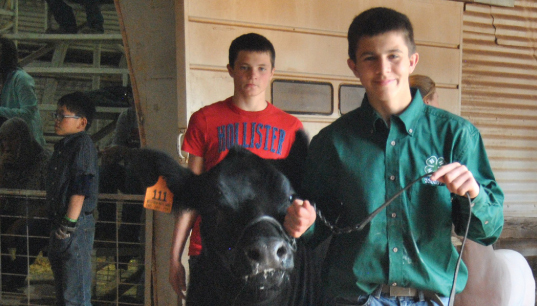 After months of work, our young men go on to learn from the competitive experience of livestock shows. Some days they have to learn how to be a good winner; others, they must find a way to learn from a loss. Both allow them to grow and to find success in life in a broader sense. More than one youth has discovered the importance of responsibility and the thrill of success through our on-campus pig program. They work with their pigs at the Michael Bethel Swine Barn on our west campus. The young men regularly wash, brush, and walk their swine. They feed and water them every day, and see to the cleaning of all of the pens. They also practice showing the animals, so that at show time they have experience moving with the pig in the show pen under the watchful eyes of a judge. First, our young men show their pigs at the local show, then at the county, and then at the state show (Oklahoma Youth Expo). When past all of their shows, the young men clean up the pig barn to make it ready for the coming Fall. The pigs either go to the market through OYE or they go to our commissary. The pigs continue to be important as they become the high-quality ham, bacon, and sausage on the dinner table at Westview. The horse program is currently in the process of undergoing significant redesign. More will be posted on this site as this program once again becomes viable.